My family had a spontaneous lunch the other day and we decided to go for pho. It’s been quite a while since my last visit to Thai Son but I had always liked it. It’s located near the end of Alexandra road and Garden City. It’s near the House of Tofu Soup which I still haven’t been to . Due to its location on the second floor, you might miss it. When I say we’re going for pho, I usually get something without the soup. Yes I’m weird like that. 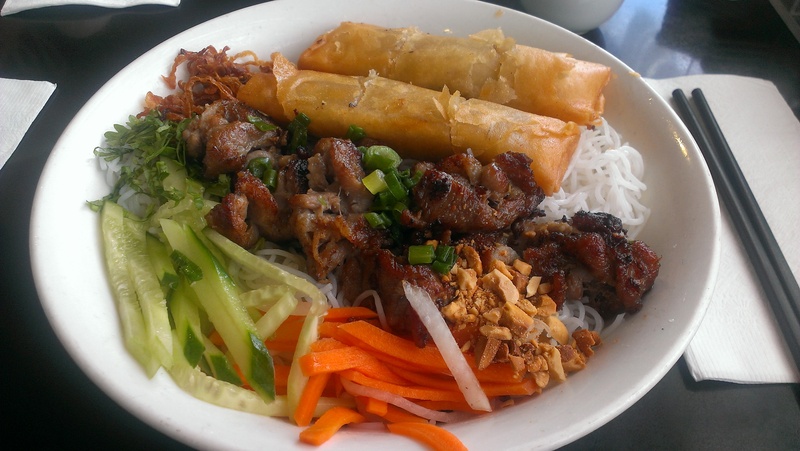 This is the Grilled Skewered Pork with Spring Rolls on Vermicelli. I wanted this dish because it came with two spring rolls and my family doesn’t like ordering spring rolls. Yay more for me? The pork was cut into smaller pieces, presumably because they were skewered beforehand. It had a nice sweet taste with some slight smoky flavour. The spring rolls were perfectly hot and crunchy on the outside while the filling inside was flavourful. Of course it all went well with the sweet sauce that came with this dish (I can drink that stuff!). There were a lot of noodles too and underneath the noodles was more lettuce and bean sprouts. Unfortunately the bean sprouts were raw and I would have liked it if they were cooked first. I like that there was some of everything in here! My brother had the large Pho with Rare Beef and Tripe. After looking at this picture again, I realized that there was a lot of oil floating on top… o___O I also found the broth to be too salty. Noodles were good though. My dad had the cooked beef version of this so I won’t include the picture. Thai Son has quite a few locations now and I’m not sure if the salty broth was a one time thing but we still enjoyed our food here. Prices are fair and it’s also clean too. 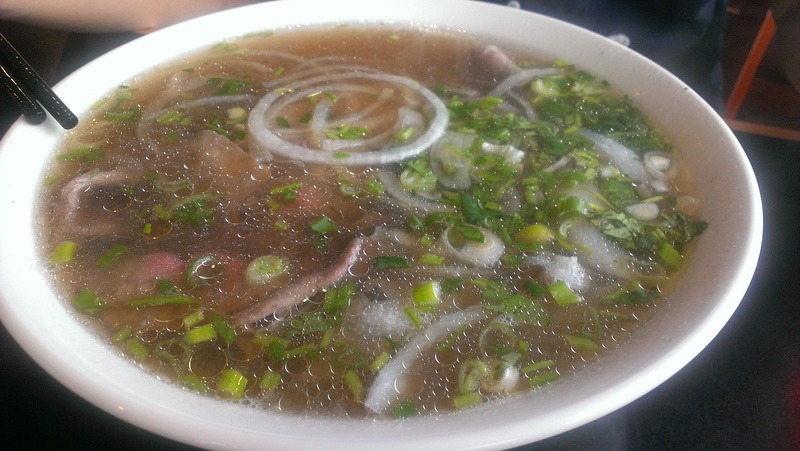 This entry was posted in Food Reviews, Vietnamese and tagged pho, spring rolls, Thai Son.